A brief history of twenty-two imbecile children. Philadelphia : U. Hunt & Son, 1858. Description : 147 p.,  leaves of plates ; ill., ports., 20 cm. Photographs : issued with up to seven mounted salt prints. Photographers : varia, Gutekunst, Frederick, 1831-1917. Subject : Pennsylvania Training School for Feeble-Minded Children. Feeble-minded education in Pennsylvania. Exceptional children. The first photographically illustrated medical book published in the United States. Possibly inspired by Diamond's photographs of the mentally ill (and other photos) which excited considerable attention at the 1855 world exhibition in Paris, this work was similarly furnished with photographs and was published not long afterwards (according to Gernsheim 1961, p. 88). ***Gernsheim in her 1962 article could not identify the author. The author, Isaac Newton Kerlin, signed it on the last page. Introduction by Joseph Parrish (1818-1891). 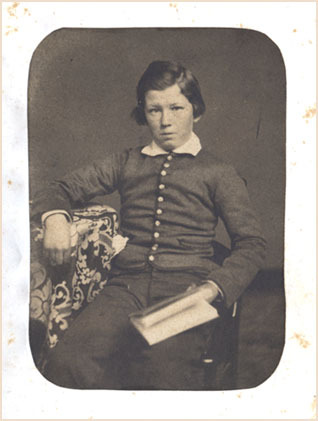 Thirty three years later Kerlin published a book of rules and policy guidelines for for the Pennsylvania Training School (Manual of Elwyn; 1863-1891 (Philadelphia, Lippincott, 1891). This book has two photographic illustrations one of which is a frontispiece portrait of Kerlin by Gutekunst. Exceptionally rare book and doubly valuable for the two salt prints executed by Frederick Gutekunst. Both prints are group photos presenting ten of the children who resided at the Pennsylvania Training School for Feeble-minded Children. † Diamond, Hugh, Journal of the Photographic Society of London, September 21, 1858, 30.